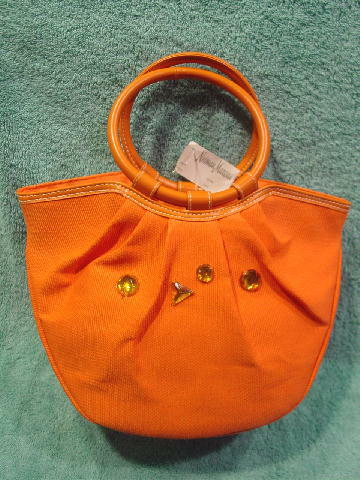 This never-used orange fabric purse is by Neiman Marcus and was originally purchased there. There is a thin ribbed texture on the surface. 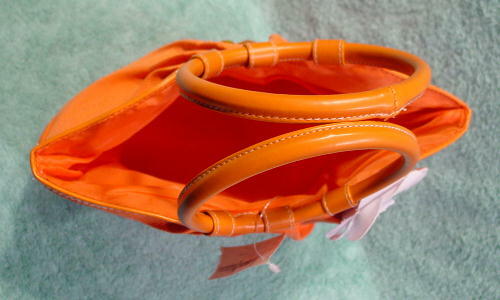 It has two orange leather circular shaped handles and orange with white accent stitching accents. 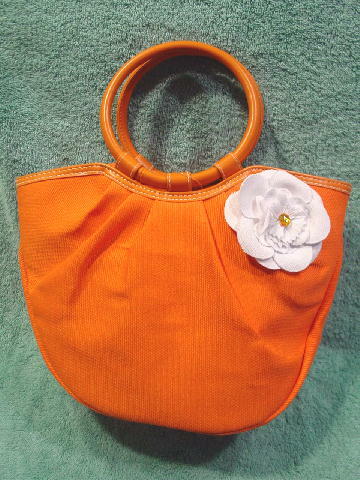 The purse originally came with the white fabric flower pin, but Eden added the orange-amber faux jewels, one in the center of the flower and four on the back. It has an orange sherbet synthetic lining with a Neiman Marcus tag sewn on the inside. The original store tag is still attached. It's from a British model who got it as a present. She sold it because she needed the money and was returning to Europe before she could take it back to the store.